With excellent sound quality, plenty of power and the ability to stream music from your NAS or phone, the SR 5009 offers the music lover an above average 2-channel sound system. For the movie buff, the SR 5009 provides ample power for a moderate sized home theater with very good auto room correction, an intuitive GUI, and support for 7.1 channels. If you are interested in Atmos, you’ll have to move up to the next receiver in the Marantz line. Add to this a very useful App, a well thought out remote, and distinctive styling, the Marantz SR 5009 may well be just the receiver you are looking for. Marantz (D&M) has been making hifi equipment since way back when. My first into to real high fidelity was a Marantz 2226B receiver back in my college years, circa 1979. The blue glow of those diodes, needle dials and the “fly wheel” tuner knob served me well for several years. I’d listen to music throughout the evening just to relax and be awash in the blue glow of that beautiful, chrome faced receiver. Today, their receivers look like nothing from yesteryear, but their reputation for sound qualities still lives on. If much of your music listening takes place in the digital domain, you’ll be impressed with the SR5009’s many digital music features. Built-in Wi-Fi makes it easy to connect to your home network, but you can also connect with a LAN line. I selected the later because it is a more secure connection to my WD MyCloud NAS, but the dual antennae on the back of the Marantz pulled in wifi very well, too. Apple users can stream tunes from an iDevice of choice, or a computer running iTunes with AirPlay. In my review, I used my Mac Mini. You can connect your iPod or iPhone to the front-panel USB port and control it with the receiver’s remote. Marantz has a very useful App that you can download that provides almost all of the features of the remote, as well as providing a visual display your entire music library in the palm of your hand. Android users will appreciate Bluetooth connectivity for wirelessly streaming audio from any App on your device. Spotify and Sirius XM subscribers can listen to their favorite playlists or stations. There is built-in support for Pandora and hundreds of free online radio streams. They have not forgotten you high resolution music fans either. The SR5009 can play files with sampling rates up to 24-bit/192kHz as well as DSD files. With its internal seven-channel amplifier, it can be configured for two-room output. Simply assign the surround back channels to Zone 2 and you can send audio to a set of speakers in another room. While the wife listens to Pandora on the porch, you and the kids can watch Frozen (yet again) in the main theater room. You can assign the back surround channels for front height speakers or bi-wire to your mains. For video, it will pass through 4K at 60 Hz and will upscale lower resolution video to1080p or 4K if you have a new UltraHD set. Power is provided by their HDAM (Hyper Dynamic Amplifier Module) system, which combines ultra fast slew rate and maximum dynamic range to deliver optimum sound quality along with Current Feedback technology, which provides a wide closed-loop bandwidth. This is the same stuff found in some of their higher end units. The look and style of the SR5009 is quite distinctive, with a rounded edge front panel and a “porthole” display window. My first impression of the display was, “How can that tiny window display anything?’ However, first impressions can be wrong. That little window not only looks distinctive, but it proved to be quite functional as well. If I was streaming, let’s say Bach’s Brandenburg Concerto No. 3, the display would scroll “JS Bach- Brandenburg Concerto No. 3 in G Major, BWV 1048, movt. II-Adagio”. It repeats this line until it goes on to the next movement. Here, for example, is Emerson, Lake and Palmer Trilogy. I use it as an example because it fits the whole display, so you get the idea. When I preformed the software update after first turning on the SR 5009, it displayed the % download and gave an ETA for completion. Nice! All of this can be displayed on your TV, too, but should you choose not to turn it on, the little display works fine on its own. Another useful feature was the “Info” button on the remote. When pressed, it would briefly display what was going on with SR 5009. The OSD reveals the incoming signal, sample rate, what speakers are being feed a signal and what mode your outputs to the speakers are. Also, the ECO display would tell you your “real time” power consumption use. You can pop this information up at any time, whether you are streaming, watching a movie or listening to a CD. I liked this function a lot because it kept me abreast of what was going on as I was changing sources. So what’s in the box? Besides the actual receiver and remote, there was a CD-ROM manual, the Audyssey mic with a cardboard stand (clever design, I might add, but I stuck with my trusty mic boom), labels for your cables and a detachable power cord. I understand the need for the digital copy of the manual, but having the actual booklet in hand makes the set up go faster. After my initial set up, I plugged in my network cable, powered up the SR 5009, and was immediately told an update was ready. After selecting to proceed, the receiver connected and the new software uploaded in about 25 minutes. Going into the set up menus, I was surprised with the amount of control and ease of use the GUI system provided. Running the Audyssey Laboratories’ MultEQ- XT six-point auto setup and room calibration system was easy enough that a complete novice could perform it with relative ease. The on-screen display made it virtually fool proof and the overall audio performance sounded so good, that I left it engaged for the entirety of my review. Of particular notice, it got the bass in my room just about perfect...better than most other correction system I have used in the past. You can, of course, set up your speakers manually. The distances can be set to within inches (or centimeters, if you prefer), and a fully manual EQ can be set up as well. Dialog can also be enhanced if you desire. In the back, all of the usual connectors are available. I find that the speaker terminals are a bit tightly packed together, but if you use bare wire or bananas over thick spade connectors, you will be fine. Hooking up the pre-outs to my amplifiers was easy. Marantz supplies labels for your interconnects and speaker wires to assist you in your hook-ups. Since the SR 5009 is designed to be the center piece of your home theater, it can also function as a music machine, as well, whether you listen to stereo or multi channel music. Marantz has always been known for their excellent sound quality, and the SR 5009 is no exception. Let’s start by discussing the sound quality and versatility of this receiver. My musical taste is somewhat eclectic, with a heavy leaning toward classical and orchestra music. Bartok’s Concerto for Orchestra (Fritz Reiner and the Chicago Symphony) plays out like musical murder. Dissonant, jarring crescendos and angular rhythms, this over 50 year old recording on SACD is marvelous and exciting to hear. Even though this recording is in 3-channel, it filled my front wall with great depth, as well as width. Brass, strings and percussion sounded realistic and natural. Strings had bite, brass had a well rounded tone and the percussion was tight and deep. Vocals sounded natural and full without over emphasis or sibilance. I listened to CS&N Greatest Hits, which is a HDCD. Instruments and vocals were well placed in a 3D space. Bass was punchy and tight. The” boys” voices blended impeccably with pleasing harmonies. Acoustic guitars had a natural balance and detail you would expect. You could easily hear the fingers sliding along the strings of the guitars. You could even hear the slight breath intake before a phase was sung. Overall, sound reproduction was beautifully rendered by the SR 5009. Sonically, I would have had difficulty distinguishing the overall sound quality from my Emotiva UMC-200 pre/pro. If I had to permanently swap units, I could easily live with the SR 5009. The Marantz certainly has more features than my UMC-200 and a super GUI that is a tweekers dream. Even though it made my pre/pro seem a bit primitive, I still love its simplicity and sound quality and have no plans to replace it any time soon..
Changing pace, I streamed the same music from my NAS (WD MyCloud) with the same results in sound quality. Using the Marantz App (free), I began to appreciate streaming directly without having to go through my Oppo 103. My pre/pro has to use the Oppo as a bridge. The App proved to be quite stable and it was a snap to go from one input to the next. I could stream from the NAS and instantly switch to TV or internet radio stations, all without getting out of my chair. The radio stations alone can keep you glued to you chair for the rest of your life. I did hit one anomaly while streaming, however. The SR 5009 would not directly play hi-rez multi-channel music that the Oppo 103 had no trouble with. I have several selections from the Scandinavian music company 2L that would not play at all. Perhaps a software update could remedy this? Otherwise, if you have all your music ripped to FLAC, WAV or in my case AIFF, this unit is set to go. The ease of going from one song to another made my wife ask, “What are you doing? I hear classical one minute and Jethro Tull the next and then you’re off onto Vangelis!”- What can I say? I’m an eclectic kind of guy, remember? Moving on to movies, I selected Prometheus. The sand storm scene is very immersive in 7.1, and the SR 5009 delivered the goods here as well. The storm swirled all around me and really ratcheted up the tension in that scene. You could easily hear sand, stones and wind whipping around you. In Batman Begins, the “tumbler” scene is a good demo of the dynamics and deep bass extension that your system can accommodate. I played that scene loudly and was rewarded with some tremendous dynamics. With Audyssey engaged, the sounds all melded with the room and provided a vivid and coherent sound field, with no over emphasis on the surrounds or subs (of which I have 2 in my theater). Front to back pans were without gaps. The seamless sound field allowed me to get into the movie and never pulled me out because of some sonic hiccup in the playback. Here again, I preferred the sound with the EQ engaged. When comparing EQ on verses EQ off, I would describe the difference as subtle, but EQ engaged made the speakers less localized and the overall soundscape being better blended. I used the SR 5009’s amplification as well as using the pre-outs to my Emotiva LPA-1 and dual UPA-1 mono block amplifiers. Having pre-outs gives you so much more flexibility. You could provide mono blocks on the front R/L while using the SR 5009 amps to power you center and surrounds, for example. 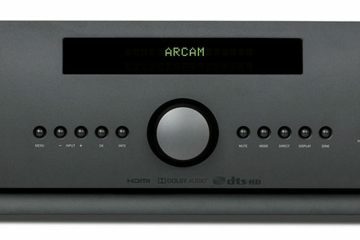 The only down side is that this receiver does not provide for Dolby Atmos. You’d have to move up to the next model up to get that feature (AV 7702, for example). Personally, I don’t think that omission would be a deal breaker for me, but it might be something to consider if the thought of Atmos makes you all tingly inside. Another thing I noticed when running the SR 5009 for extended periods of time: heat. I measured the surface temperature at 105 degrees near the front left side of the receiver with a digital thermometer. This occurred whether I used external amplification or the SR 5009’s own internals amps, so I wonder if I was getting heat from the power supply or perhaps the processor. In any case, it was moderately hot, but no more so than any other receiver I have test from Pioneer or Onkyo. I only mention it, too, because my Emotiva per/pro and amplifiers all run cool to the touch. Sonically, I liked what I heard from the SR 5009. It performed well with both movies and music. The streaming from my NAS was a lazy man’s fantasy. The remote was well laid out and the INFO button quite useful. The App worked without glitches and could easily do everything the remote could do. The pre-outs allow for you to beef up your system with bigger amps and different options. Be forewarned that it runs a bit on the warm side and if you have future aspirations to step up to Atmos, you will have to look for something else. However, if you are in the market for a 7.1 system that plays music well, this Marantz should be near the top of your list. Because of the features and ease of set up and use, I liked what the SR 5009 offers over much of the similarly priced competition. Now if I were to wax nostalgic, the only improvements I could wish for are blue diodes and that slick flywheel tuner knob. But then again, perhaps I am being too eclectic.